How well does Seg-El fulfill his mission during the first season of the Krypton TV show on Syfy? As we all know, the Nielsen ratings typically play a big role in determining whether a TV show like Krypton is cancelled or renewed for season two. Unfortunately, most of us do not live in Nielsen households. Because many viewers feel frustration when their viewing habits and opinions aren’t considered, we’d like to offer you the chance to rate all of the Krypton season one episodes here. A Syfy superhero drama based on the DC characters created by Jerry Siegel and Joe Shuster, Krypton is a Superman prequel from executive producers David S. Goyer and Cameron Welsh. The series stars Cameron Cuffe, Shaun Sipos, Blake Ritson, Georgina Campbell, Elliot Cowan, Ann Ogbomo, Rasmus Hardiker, Wallis Day, Aaron Pierre, and Ian McElhinney. Unfolding 200 years before the destruction of Superman’s home planet, the story centers on Kal-El’s grandfather, Seg-El (Cuffe). Seg is faced with the starkest of choices. He can either save Krypton, or allow its destruction, in order to protect the fate of his future grandson. What do you think? Which season one episodes of the Krypton TV series do you rate as wonderful, terrible, or somewhere between? 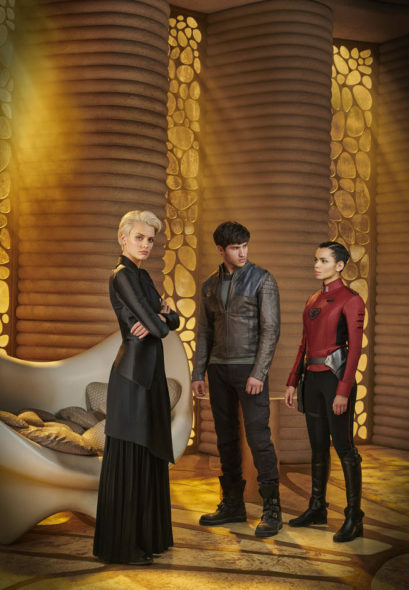 Should Syfy cancel or renew Krypton for a second season? Don’t forget to vote, and share your thoughts, below. 5/23/18 update: Syfy has renewed the Krypton TV show for a second season. Details here. More about: Krypton, Krypton: canceled or renewed? Krypton: Is the Syfy TV Series Cancelled or Renewed for Season Two? Krypton: Syfy Pilot Trailer Released; Would You Watch? This has to be one of the Worst SYFY shows ever made. It should be cancelled. It was ultra boring. I watched two episodes, and I was so disappointed in the story line. Please keep this TV series going on its has a great history of superman’s history or home I might say. love every single episode. please keep this series going on. looking forward for season 02. Please keep this show. I want to see what happens in the next season. They have to keep this show going. Ot is a great show absolutely outstanding. Please keep this show going. I’m so tired of good strong Sci fi shows getting canceled. Keep this on the air keep it going. I really like Krypton. Seeing the back story of Superman and the actors arent bad either. Only one complaint is it feels like the story has to be drawn out and not like other shows where the episode completes…not sure how to put that. I love the show!!! SYFY needs this!!!! There need to be a season 2 and less profanity for a good kid friendly movie i think it’s swell so far lots of. Action. It’s awful.. Boring and poorly acted.. It’s difficult to sit through an episode, I keep hoping it gets better.. But it’s worse than the absurdly unwatchable supergirl.. It really is joyless. A chore to watch. How its getting score in the 9’s is beyond me. You’re right! Poor show that had potencial. Every show on this site is avg. 9.2!!! I think ppl. are just ******** think up on purpose. #6 tops for this show. Because it is an interesting tale on The Superman Myth. True Sci-Fi, good story, great visuals. Usually I find prequals boring as the ending is already known. However, with this show going back 2 generations it helps put things into perspective. I’m also learning about Adam Strange as a character. Looking forward to the remainder of the episodes.